This is a publication of a speech that Michael Crichton made on May 21, 2007 at the "Who Owns Your Body?" symposium at the Kent School of Law in Chicago. It was published in the Chicago-Kent Law Review in 2009 and has recently been made available through Law Commons. Five years ago today, we lost Michael Crichton. I still find it difficult to accept. I feel he is still a part of the universe somehow. Anything else would be unthinkable. Michael Crichton was far more than a novelist. He was a brilliant philosopher who explored ideas and issues through fiction. On a wide range of important topics, he ignited analysis and debate among readers around the world as few writers have ever done. Crichton’s strength was not in the answers he provided, but in the questions he provoked. His death is a tragic loss, but his books will continue to entertain and educate readers. I just went back to the article and found some other comments that illustrate how Michael Crichton will continue to live through his work. Many future readers will have their minds illuminated through his words. I was an extra in the movie version of “Coma” which Crichton directed back in 1977. (It was filmed in and around Boston.) I remember being shocked the first time I saw him on the set – he was 6 ft. 7 and I don’t think I’d ever seen anyone that tall before! My memory of him as a director is that he was low key and in control, everything went smoothly during the production. It is so sad to hear of his untimely death. Michael was unassuming, good natured, and a friend, though we were separated by years and distance. We often breakfasted together on Saturday mornings on Kauai after the farmer’s market when we both lived there. He told me he always considered himself more of an anthropologists and each novel, a paper for class. He had a wonderful sense of humor. I miss him. 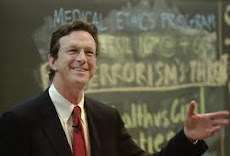 Michael Crichton is to a large degree responsible for at least one professional biologist – upon reading The Andromeda Strain as a small boy (and I still have that copy), I became enthralled with molecular biology. His writing launched me on my scientific career path thought MIT and Harvard, and I have read all of his subsequent books. Thank you so much , Dr. Crichton, and rest in peace. My life would have been much different without you. I see a last book was scheduled for publication in early December – was it near enough to completion to be finished and released? I have never read a Michael Crichton book, but I am still a big fan of his. By the time my daughter Alice turned 12, she had read eight of Crichton’s books. I took her to see him at a book signing for the novel Prey. At the time, Alice was a shy girl, and she fretted about what to say to someone she looked up to so much. Mr. Crichton immediately made her feel at ease and was wonderfully kind to her, asking her questions about her favorites. Alice and I both left that meeting as enthusiastic fans of Michael Crichton. I read all his books in high school, and still count Sphere as a top 5 book – always fascinating and engaging stuff – but his non-fiction book ‘Travels’ really changed the way I saw the world, made me very curious about things I’d never thought about. I have huge respect for him. His legacy for me and hopefully a lot of others is to let laziness and incuriousness be damned. after admiring him for many years, i met mr. crichton at a fundraising talk he gave for a community center. i was working the sound system for him. he was so incredibly gracious and appreciative toward me, the lowly sound guy. after it was over, he sought me out and thanked me for my work. he was not only a brilliant thinker and gifted storyteller. He was a genuinely kind & caring person. to his family, i’m so sorry for your loss.